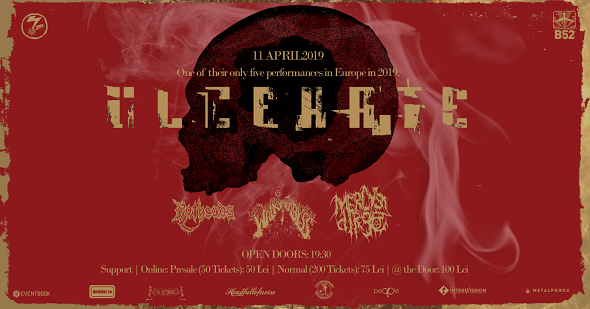 We have the pleasure to announce that Ulcerate will have one of their only five performances in Europe this year in Bucharest. Auckland, New Zealand-based unorthodox death metal act Ulcerate was formed by guitarist Michael Hoggard and drummer Jamie Saint Merat in 2000, with the aim of creating dark oppressive death metal. This focus has since developed and metamorphosed into a far more dynamic approach with a fully realised sense of atmosphere and mood, while furthering their foray into the darker end of the genre’s spectrum. The band has remained DIY where possible, handling all facets of album production and visual design. Ulcerate recorded their first demos in a two year period between 2002 and 2004, the latter of which ‘The Coming of Genocide’ garnered the band it’s first taste of international attention and critical response. A line-up shift introduced vocalist Ben Read and live guitarist Michael Rothwell into the fray, and from here preparations began for the band’s debut album, released via Dutch label Neurotic Records in 2007. ‘Of Fracture and Failure’ offered 9 tracks of crushing dark death metal, a new-found appreciation for linear song-writing and a mix of pure rhythmic and dissonant extremity. They toured New Zealand extensively and secured main support slots for Nile, Decapitated, Behemoth, Cannibal Corpse, Deicide. In 2009 the band’s bassist Paul Kelland stepped up for vocal and lyrical duty, and brought the band back to a vocal attack not unlike their first demos, and Oliver Goater was recruited as live guitarist. Signing with Willowtip Records, they released the widely touted ‘Everything is Fire’ – punishing, churning dissonance mixed with their trademarked sense of melody and textured rhythm work, coupled with a greater foray into mood and atmosphere. The album received incredible critical response internationally and cemented Ulcerate’s place in a truly global sense. New Zealand and Australian headlining tours ensued, and in late 2009 they toured throughout Europe for 5 weeks with Nile, Grave, Krisiun and Corpus Mortale. Throughout the months of 2010 the band developed what was to become ‘The Destroyers of All’, which saw the light of day in January 2011. Ambitious, oppressive and expansive, with a strict adherence to the tradition of total bleakness the band is known for, ‘The Destroyers of All’ presented the most atmospheric and challenging listen from the band to date. Again, critical response was exceptional. In support of the album, headlining runs of New Zealand and Australia were again undertaken and in 2012 Ulcerate will tour with French horde Svart Crown for 4 weeks in February and make their debut on US soil at MDF X, as well as a handful of side-shows. The band will commence work on their Relapse debut, album number 4, in early 2012.